Toy Story Land is coming! And I honestly think there’s no better way to celebrate a new land opening at Disney than with shirts, which gave me the perfect excuse to make this Toy Story shirt! As if I need another reason to be obsessed with all things Disney, and yet….here I am. Disney vacation shirts are quite possibly my favorite things to make now that I invested in a Cricut Easy Press they’re so much easier and faster to make! And since Toy Story Land is opening at Disney’s Hollywood Studios at the end of June I have a reason to make even more shirts for me and my family. I know Chris can totally get behind this trend because Toy Story is his favorite movie and Buzz is his favorite character. Lately, I’m surrounded by Buzz, Woody, and all their friends on a daily basis. Chris watched the movie with our toddler recently and now he’s obsessed. He asks to “watch Toy Story” at least 10 times a day and doesn’t quite understand why Mommy keeps saying no to all that screen time. I was never a super fan of the movies but I did think they were cute. Except number 2. I cannot stand Jessie (ironic that she’s on the shirt, huh?). But now I’m pretty sure I can quote word for word the first movie. That’s how many times I’ve watched it in the past month. But I can deal because the toddler thinks it’s hilarious whenever Buzz and Woody are fighting, and those little giggles melt my heart. So I tend to give in a little just so I can hear the laughter. And also because Mr. Potato Head and all his sassiness is the best part of the movie. I mean, when Andy gets sheets for his birthday and Potato Head asks, “who invited that kid? '” I die laughing. Every time. To be honest I really can’t wait to take him to the new land (hopefully they have a passholder preview this year so we can see it before it officially opens to the public!) and see how he reacts to all of his favorite characters. That’s the best part of going to Disney, seeing the excitement and joy on your kid’s face. a good way to use up some of your scrap vinyl! 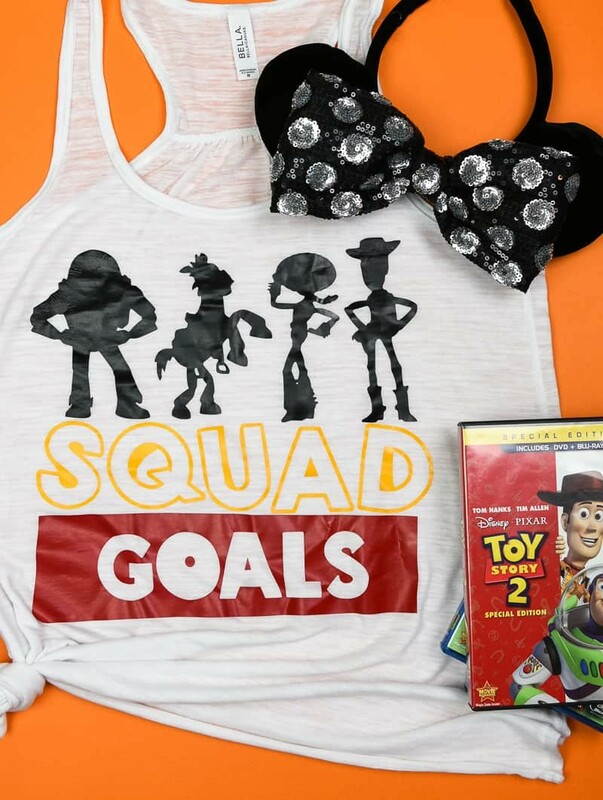 How to make your own Toy Story Shirt! + To get this design, I found coloring pages on google and traced the characters in the software. (first, this is NOT legal advice. I just want to get that out of the way but…..) BE WARNED. These characters are licensed property of Disney and you cannot sell or redistribute them in any way. + Because I have the Designer Edition of the Silhouette Software I can cut by color. So I cut out each color and then pieced them together on my shirt. Don’t forget to mirror your image BEFORE hitting cut! + Heat up your Cricut Easy Press (or iron) and place a teflon sheet over your image. PRO TIP: Do not let your transfer tape from one section overlap onto the design above or below it. My transfer tape that was on top of the word SQUAD overlapped onto the characters feet and completely ruined the design. I had to buy this stuff to take the vinyl off and redo it. I was so bummed! Though….that liquid vinyl remover was a lifesaver and I’m so glad I have some in my craft room now! + Press your design with your Easy Press or iron. The best way to do this is to press section by section. I typically press for 10 seconds, peel up the transfer tape and make sure that my design has adhered to the shirt (if it hasn’t lay the transfer tape back down and press again until the vinyl stays on the shirt). Keep doing this until each layer is on the shirt. Then lay a piece of transfer tape that covers the entire design and the teflon sheet back on your shirt and press the entire design for 30-60 seconds. Plan out how you’re going to press your design. I recommend going from top to bottom! (remember to measure 1.5-3 inches down from the collar of your shirt to place your design. This is personal preference, but I like my designs to sit about 1.5 inches down from the collar for perfect placement. Cut your transfer tape as close to the vinyl as possible without accidentally cutting your design. You never want your transfer tape to be on top of an already pressed layer. That’s because when you go to press the next layer it’ll pull up the already pressed layer and ruin the shirt. If that happens there are two ways you can try to get it off. (1) Turn your shirt inside out, repress the vinyl and then use tweezers to try to pull it up. If that doesn’t work try this: (2) Use the vinyl remover! Make sure the follow the instructions on the can and it’ll come right off. Seriously the best money I’ve spent in a really long time! You only need to press each layer for 10-15 seconds to get it to adhere to the shirt. When you’re pressing multiple layers you don’t want to press for the full 30-60 seconds until all the layers are on the shirt. Once all the layers are on then you do one final press for the full time (with the Cricut Easy Press it was 30 seconds). 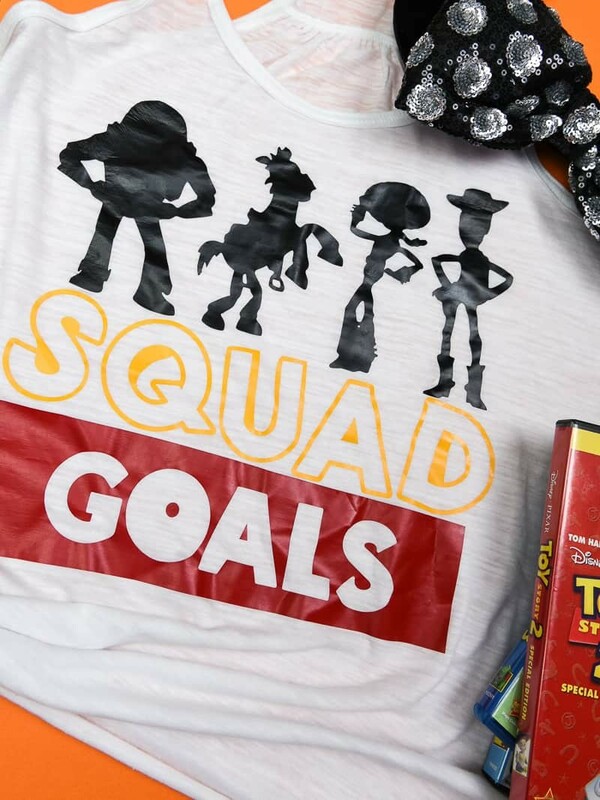 I wore this Toy Story shirt on our recent Disney trip and as we were walking through one of the stores in the parks I saw a Jessie bow that is for the interchangeable Mickey ears (they’re actually the black ones I have in my pictures!). I kept telling Chris that I was going to buy them because I needed them for my shirt, and I never got them. Chris kind of talked me down. I don’t know if it’s just me but these ears give me a headache after a while so I can only wear them for so long. If you have tips on how to make them more comfortable, I’m all ears! I hate spending money on things that I don’t end up using as much as I’d like! And if you want to take the Toy Story shirt to the next level, I think you should pair it with a DIY magic band decal, like the ones I did here. Need more Disney crafts in your life? Me too, here are a few favorites! Hi! Can you share the name of the fonts you used? Hi Stacy! 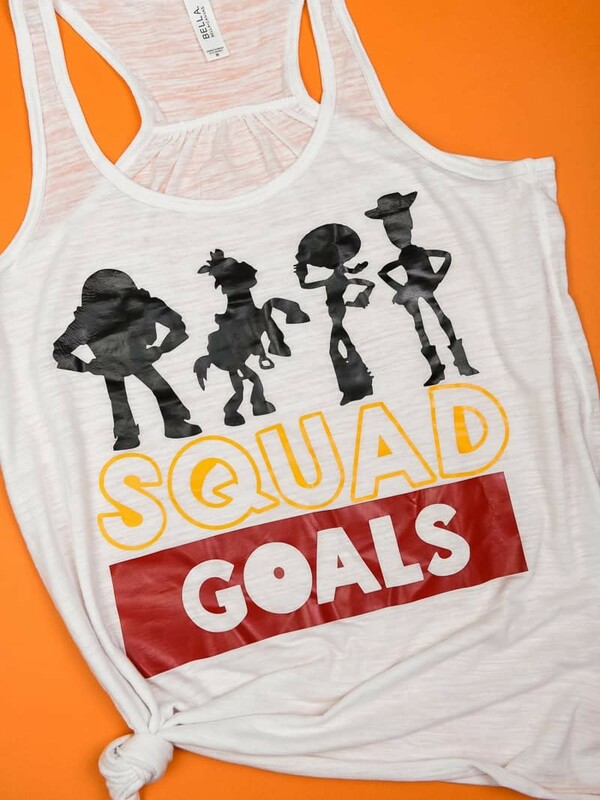 Both fonts were heavily edited for the squad goals shirt, but I believe I used Tokyo for SQUAD and Genplan Pro for GOALS.